About a week ago, ChefMom sent me this picture wondering if I was interested in having some: DUH! Big thanks to ChefMom for helping keep the VegFam's bellies happy and full. ChefMom gifted me an heirloom pumpkin, 2 delicata squash, 2 buttercup squash, 2 acorn squash, and 1 huge spaghetti squash. 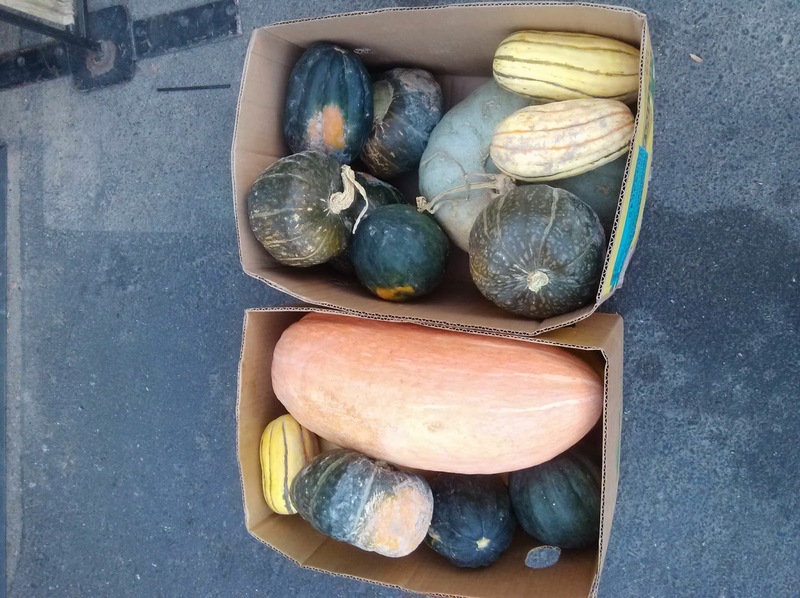 If you click on the name of the winter squash listed above, you can see how I prepared them. Obviously, this post is dedicated to the spaghetti squash. This dish is light, bright, and tangy. I have a feeling I will be seeing a lot more of this when the heat comes back. Cut our squash in half and scoop out all those seeds and junk. Put the cut side down on a pan with some water in it and roast that sucka until it's tender to a fork touch, about 40 minutes. Get the garlic all nice and brown in a bit pan, then add in your broccoli florets. Cook until tender. Whisk together the olive oil and the lemon juice until two become one, emulsification baby! After you remove the squash from the oven, let it cool, scrape out the noodles, and add it into the broccoli, add in your seasoning and nutritional yeast. Cook for about 5 minutes in your big broccoli pot. Take the oven down to 350. Combine the squash and lemon mixtures into a casserole dish: cook until heated through and looks mouthwatering, about 30 minutes. P.s. yesterday I decided to start keeping a food picture diary, ya know to start keeping track of what I'm eating or whatever; it just so happens I'm keeping this food picture diary on instagram. So if you're interested in following, click here.